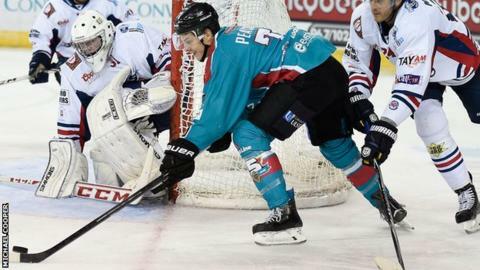 Belfast Giants were hammered 5-1 by Coventry Blaze in Sunday night's Elite League clash in England. The visitors moved top of the standings by beating Braehead Clan on Friday and they made a good start with Kevin Phillips netting after 61 seconds. But the Blaze hit back in style and led 4-1 by the end of the first period thanks to Ben Arnt's double and goals from Ryan O'Marra and Rory Rawlyk. Derek Lee added the fifth early in the third period. Braehead failed to take advantage of Belfast's slip-up with the Scots staying second after losing 6-2 to Hull Stingrays on Sunday. Belfast replaced the Clan at the Elite League summit with a 4-1 victory at the Odyssey. Craig Peacock scored twice for Steve Thornton's side while Colin Shields and Kevin Saurette were also on target. The Giants are back in action next Saturday with a league encounter at home against Cardiff Devils.